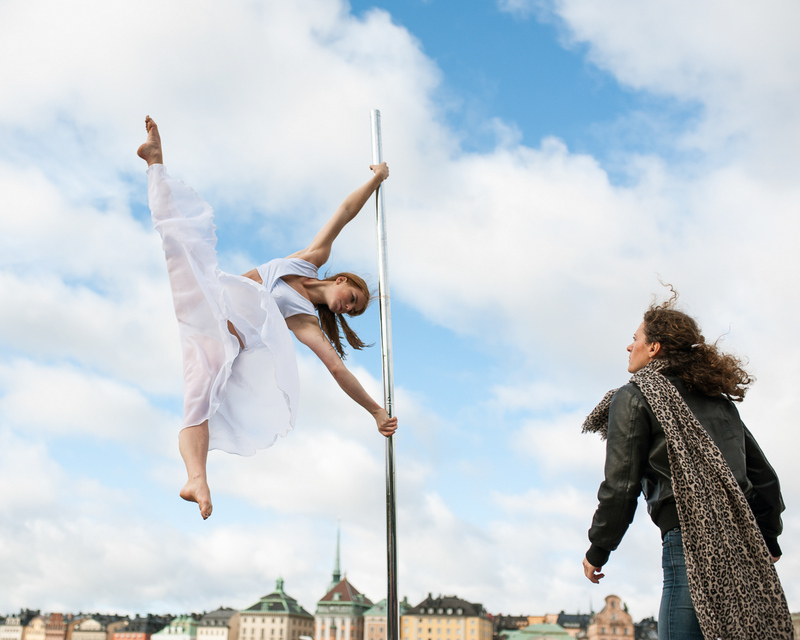 This weekend I met up with Anna Valfsson and Elena Malioutina at Skeppsholmen for a pole dance photoshoot. It was a bit overcast but the weather report promised better weather during the day, so we borrowed the portable pole from Vida Pole and headed out. Unfortunately we forgot to bring the hex key needed to assemble the pole. Luckily for us the location we picked was frequented by tourist buses, and one of the kind bus drivers found a set of hex keys in his toolbox. With the pole sorted, we were able to start our photoshoot. Here is a glimpse from our photoshoot. Anna Valfsson. The sun broke through the clouds as we started to photograph. Here rather than shooting Anna completely against the sky, I wanted to include some of the houses, to place her in Stockholm. Anna Valfsson and Elena Malioutina behind the scenes. Elena Malioutina shot from a low angle against the sky. Elena Malioutina. This angle might have seemed obvious, but it took me a while before I realised it would be nice to have the ship af Chapman in the background for some of the photos. Anna Valfsson doing the Titanic. I like how her pole is mirrored by the masts on af Chapman. Elena Malioutina. Red is a great colour for standing out in a photo. Elena Malioutina and a curious dog. It is always fun to include some of the passers-by in the photos. Anna Valfsson in a split on the pole. Lots of the passers-by stopped to watch for a bit before continuing. Anna Valfsson and a busy tourist. We ended up staying there for about four hours. It was a beautiful day, thanks to Anna and Elena for joining me on the quay! To see more pole dance photos, check the pole dance tag on the blog.